Deborah Meyer is a photographer based in Minneapolis and Mérida who holds a long-standing background as photo stylist, producer, and co-designer for both local and national advertising projects. In addition to her freelance work, she maintains a part time position at Walker Art Center. Deborah has been an instructor at IFP Media Arts for the past twelve years. Her fine art photography has been exhibited locally and purchased for publication. Headed south of Cancun for a self imposed research trip, I detoured across the jungle for a quick weekend to explore Mérida before embarking on my work. Charming, intimate, and beautiful, Mérida invited the resulting project to happen within her city walls instead. Return trips, a house purchase, neighbors from Cuba, Manolo Rivera (1941-2006), Manolo’s adopted son Mark Swain and stays at their hotel-museum have all became part of my relationship with Mérida. Manolo, I would eventually learn, was known worldwide for his extensive Latin American and international art collections, and that in the 1980’s and 90’s supported many desperate-to-leave Cuban artists. In the presence of this inspiring figure, I knew his hotel was the place for me to teach a photographic workshop, which Manolo fully supported. I learned a little more about him during a recent drive around Mérida with Mark Swain. While heading to Manolo’s mansion, I was told that Manolo had been introduced to and became friends with Julian Schnabel, that much of the filming of Before Night Falls happened in Mérida, including the interior of Manolo’s mansion and a neighboring residence. Manolo’s is the mansion where Julian, Dennis Hopper (he was along for the fun) and Javier Bardem temporarily resided with Manolo while the project was going on. While Mark had little interest in being an extra in the film, he instead found himself hanging out with with Dennis. Manolo on the other hand, made an appearance in the film. To myself I wondered, why Mérida for the location? My neighbor Diosmel chose Mérida to live because of its resemblance to Cuba. He said, “The colonial and French inspired architecture here reminded me of the inner pueblos or provinces in Cuba . . . Weather patterns here are very similar to the ones back home.” I suspect the light is similar as well. 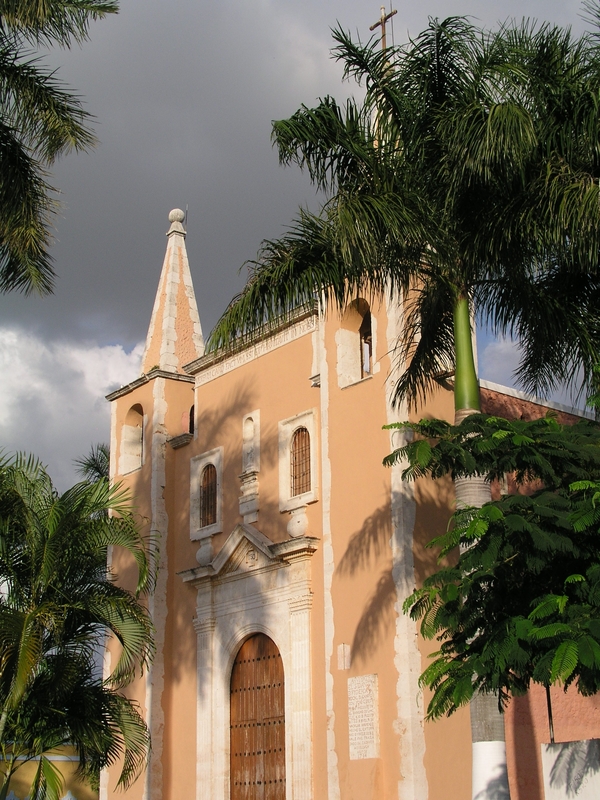 And all those pretty pastel and white buildings in Mérida are certainly not unlike colors applied to buildings in Cuba. Manolo’s mansion, according to Mark, is one of the buildings in Mérida whose architectural style resembles styles in Cuba, which is why that site was chosen to operate from. And the friendship with Manolo of course. Julian Schnabel’s Before Night Falls screens next Friday, March 11th as a part of the Julian Schnabel: Artist Director Film Retrospective and Regis Dialogue. Julian Schnabel will be here to discuss his films and his career with Walker chief curator, Darsie Alexander on Saturday, March 19th.